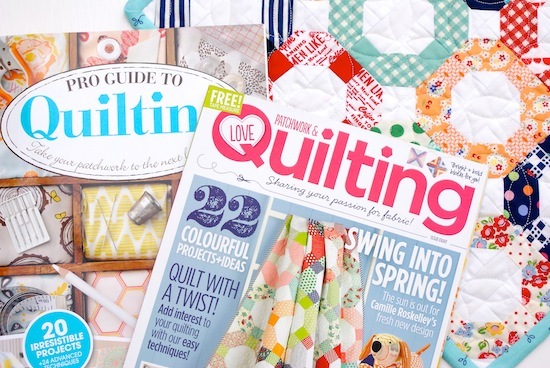 One of the lovely editors; Alice, contacted me a couple of months ago and asked if I would be happy to contribute a little interview about me, my quilting projects, my shop, how I got started - that sort of thing. As well as provide some images to use alongside the article. Little did I know it was going to be a three page spread!! Eeek! 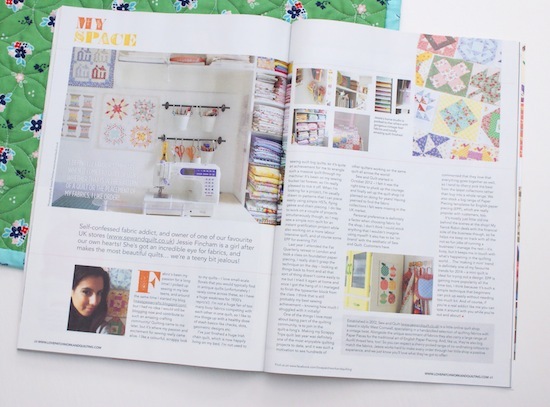 I'm so honoured to be part of the magazine, it really is a great publication aimed at quilter's like us ;-) and it does really well to promote the British quilting scene. 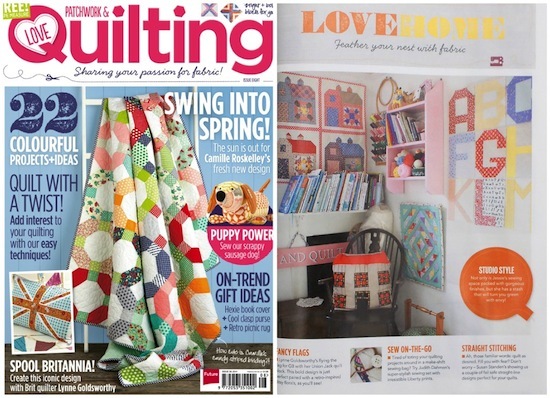 Plus, this issue is extra amazing because one of my favourite quilter's; Camille has designed the fabulous 'Cheerio' quilt as featured on the front cover. Wouldn't it make a great little baby quilt? That's what I'm planning - to gift of course! 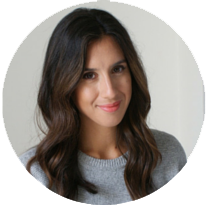 Oh, and there's a mini version too, so you know I had to make that straight away! This little mini was so fun to make, and I got to cut into the brand new April Showers collection we just got in! 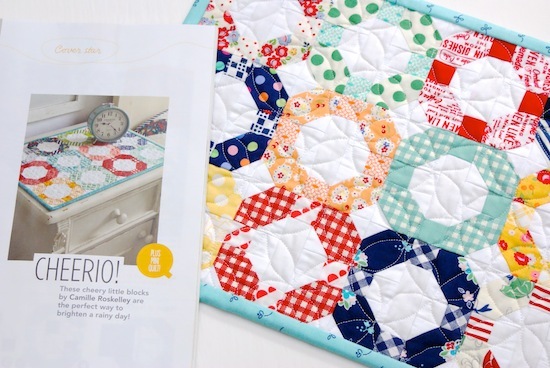 Though it's a mix of general Sew and Quilt shop fabrics - my favourite! I also did an orange peel quilting design, which I've not tried before. Using the Pumpkin Seed border quilting stencil. 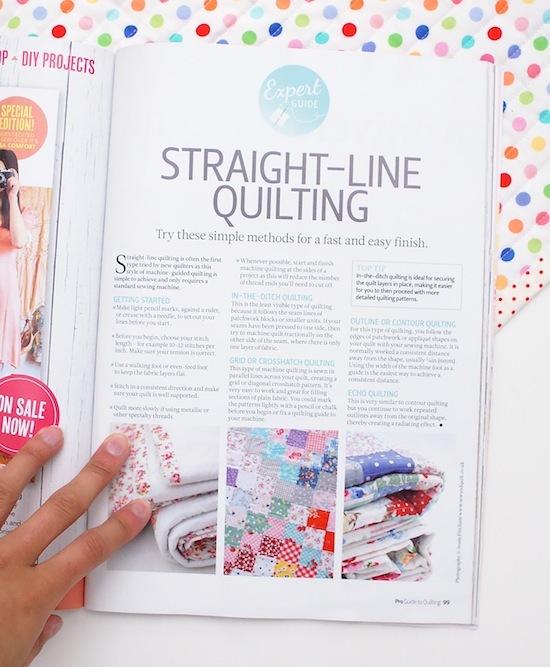 Another little feature I had is in a brand new bookazine by the LP&Q magazine, called 'Pro Guide To Quilting'. 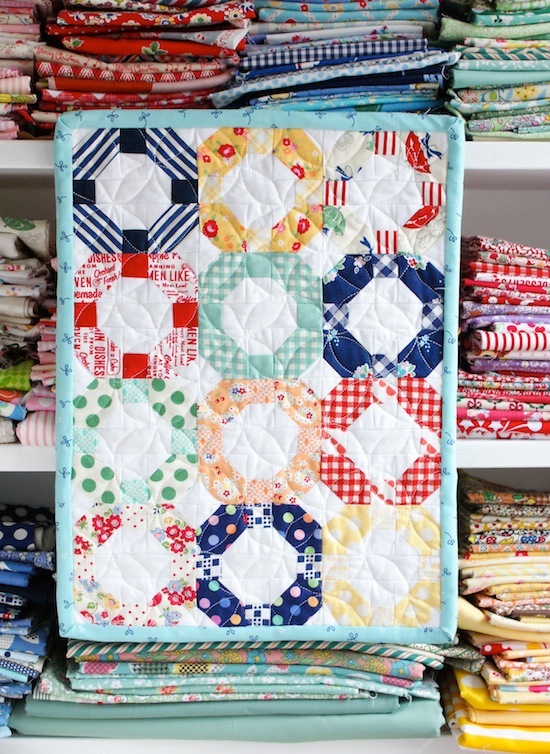 They asked for some of my Scrappy Trips and Granny Squared quilts. I already saw that and was so disappointed they don't sell this mag in my country (The Netherlands). But I am lucky, I found someone who bought it for me and will bring it over from the UK for me, can't wait! Excellent news - gonna get me a copy. Congratulations. I have read the article as it is available as a download on my iPad. Good reading, pictures, too. Congrats! Your mini is so cute! What a fabulous spread, congratulations! I don't think I've actually seen that one before (the shops around here are rubbish), I'll have to look out for it! Congratulations, that's fantastic! How exciting! Many Many Congratulations to you, the sewing room looks divine.